So you’ve been asked to bring a potluck dish to a Memorial Day cookout this weekend, and you’re thinking a salad might be an easy way to go. How about one that highlights one of late spring/early summer’s first crops, sweet corn? If you love the vegetable boiled or grilled on the cob, you (and your fellow eaters) will go crazy over its nubby kernels when they’re roasted in a hot pan. 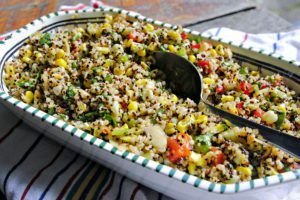 This easy, portable recipe pairs skillet corn and other veggies with protein-packed quinoa in a piquant dressing that sings of lime. For even more flavor, toast the quinoa by sauteing it in a little olive oil over medium heat until it’s golden before cooking. Make dressing: In airtight container, whisk together dressing ingredients. Cover and set aside for 15-20 minutes to help flavors mingle. Make salad: Brush a cast-iron skillet with olive oil and set it over medium heat. Once skillet is hot, add corn and brush ears with olive oil. Using a fork, gently roll corn to evenly sear. It should take about 3 minutes for corn to be lightly browned. Transfer corn to a plate and place in fridge to cool. In large bowl, toss together quinoa, cilantro, celery, bell pepper, green onions and pumpkin seeds (if using). Add as much of the jalapeno as you like, 1/2 teaspoon at a time, depending on how hot you want the salad to be. Remove corn from fridge. Set stalk end of one ear in a large bowl and hold top by the narrow end. Gently run a large, sharp knife down the cob to remove kernels, letting them fall into the bowl. Rotating corn is less awkward than moving the knife and will get you larger kernels. 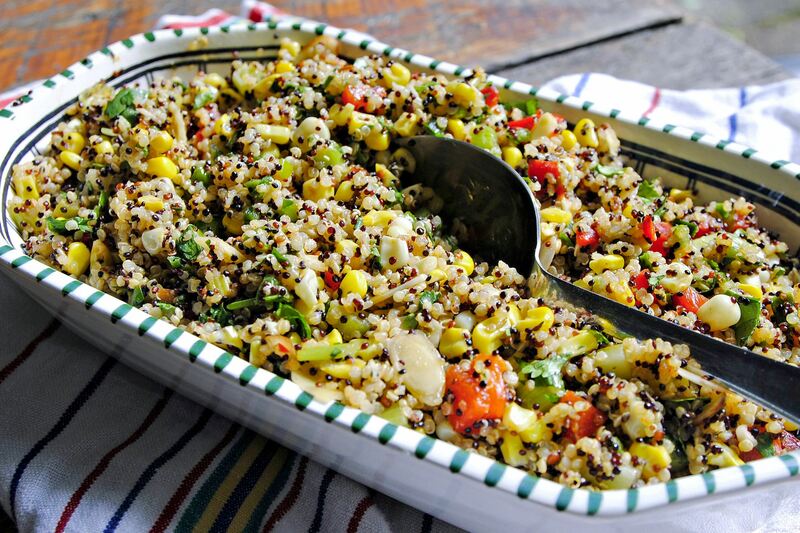 Toss corn kernels into the quinoa salad and mix with a large spoon. Mix in dressing, transfer salad to an air-tight container and refrigerate for at least 15 minutes. Serve cold, with a wedge of lime to squeeze over the top. Locally grown veggies are starting to show up in area grocery stores and farmers markets. Many of these early offerings — spinach, baby lettuces, peas, asparagus — are sweet, tender and green. If you’ve never indulged, this year you should: High in vitamins C and K (which plays an important role in bone health), and a good source of dietary fiber, it provides a pretty nutritious bang for your buck. Rhubarb also is one of nature’s top plant sources of bone-building calcium and is extremely low in calories (less than 30 calories per cup raw) — though you’ll probably end up using at least some sugar (and in some cases A LOT of sweetener) when cooking with it. But rhubarb lends itself pretty deliciously to savory dishes, too, as the chicken and shrimp recipes below confirm. 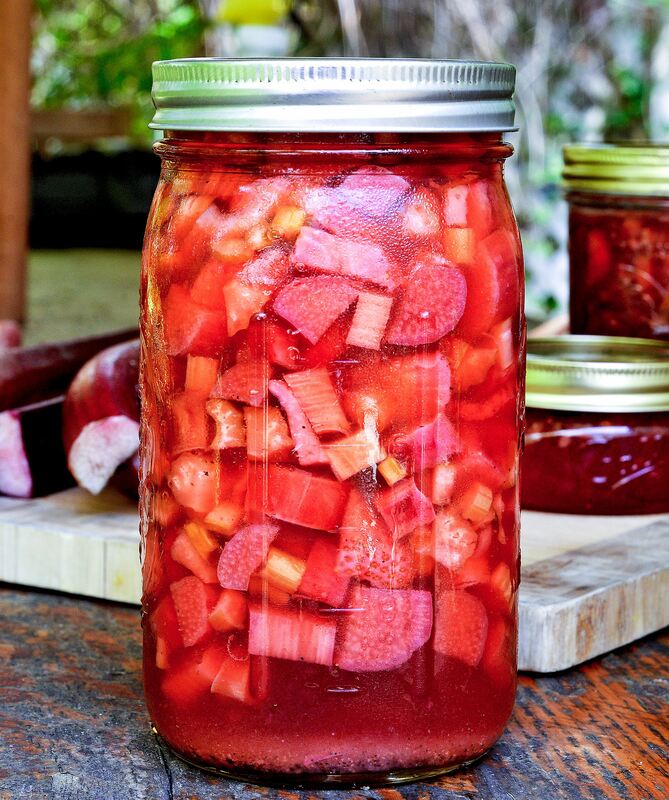 If you’re the kind of person who loves veggies preserved in brine, you’ll be delighted to learn rhubarb tastes great pickled. And don’t forget about cocktails. 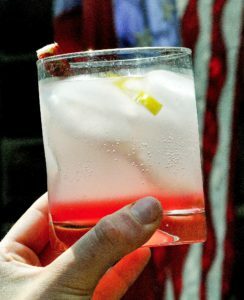 Tart and sweet, rhubarb makes for a good shrub or simple syrup. While the veggie can be traced back to ancient China, and by the 1st century was being imported to Rome and Greece, it was only used for medicinal purposes; it wasn’t until the 1700s that people embraced the entire rhubarb plant in the kitchen. One of its biggest selling points was that the crop could be harvested long before any other fruit, allowing those who had grown tired of baking with raisins and root-cellar apples throughout winter to make fresh “fruit” tarts. By 1807, its use was so common — and dare we say beloved — that a recipe for rhubarb tart turned up in the most popular British cookbook of the early 19th century, “A New System of Domestic Cookery” by English domestic goddess Maria Eliza Rundell. Because only rhubarb stalks can be eaten (its heart-shaped leaves are poisonous), the veggie comes stripped naked of any greenery. It can be either red or green, and prices vary; I found it for just $2.99 a pound at Kuhn’s (cut into 6-inch pieces and packaged in cellophane). That was half the price of Giant Eagle, where long, glossy stalks displayed among other greens will set you back $5.99 a pound. If you’d rather let someone else do the cooking, you’ll find rhubarb in various incarnations at several Pittsburgh restaurants. At Cure, Justin Severino is getting ready to put it on the menu, as part of his new salumi di mare offerings, Cynar-cured fish served with fried artichokes and pickled rhubarb and a broth of rhubarb-infused verjus with cracked coriander seeds. He also is planning a chilled rhubarb soup with sheep’s milk yogurt granita and basil panna cotta with preserved bergamot for dessert. Dustin Gardner of Casbah also is going the sweet route by offering creme brulee with rhubarb chiboust and balsamic strawberries. Sister restaurant Soba is serving a similar dessert, and the vegetable also figures into fish and noodle dishes. This sweet-tart, pretty-in-pink drink just tastes like spring. The syrup also can be used to flavor granita, to sweeten tea or lemonade or even as a glaze for chicken. Make rhubarb syrup. Combine sugar and 2 cups water in large pot and bring to a boil over high heat. Add rhubarb and stir to make sure sugar dissolves. Cover pot, lower heat just a little and boil until rhubarb softens, about 5 minutes. Pull pan off heat and allow rhubarb to cool in covered pot. Mash rhubarb, then strain juice through a double layer of cheesecloth into a small saucepan. bring juice to boil over medium-high heat, then reduce until juice is concentrated and syrupy and you are left with about 2 cups. Taste syrup and adjust sugar if necessary. Cool syrup in pan. Transfer to a container and refrigerate until well chilled. Make cocktails. Pour a generous tablespoon chilled rhubarb syrup into each of 4 chilled glasses. Add ice, vodka and seltzer to taste. Stir, then serve with a lemon strip in each glass. Refrigerate or freeze the remaining rhubarb syrup. This easy rhubarb jam is delicious on biscuits or toast, and can also be served with grilled chicken or pork. I used giant California strawberries but imagine it would be even tastier made with local berries when they come to market in June. I left out the raisins because my dad doesn’t like ’em. In 8-quart stainless steel stockpot, combine pineapple juice, rhubarb, strawberries, lemon juice, and lemon zest. Stir in pectin and add butter. Bring mixture to full rolling boil over medium-high heat, stirring occasionally. Add sugar and stir until completely dissolved, then stir in pecans and raisins. Return mixture to a full rolling boil, stirring constantly. Boil for 1 minute, stirring constantly. Remove pot from heat and skim any foam. Ladle conserve into hot jars, leaving 1/4-inch headspace. Remove any air bubbles. Wipe jar rims and threads with a clean, damp paper towel. Apply hot lids and screw bands. Process 4-ounce, 8-ounce and pint jars in a water bath canner for 10 minutes. Remove from water bath canner and let cool for 12 to 24 hours. Check seals and remove screw bands. Store jars in a cool, dry dark place for up to 1 year. Makes about 7 8-ounce jars. Tart and tangy, this peppery concoction is great with cheese or charcuterie or anything to which you’re looking to add color and punch. Mix water, vinegars, sugar, salt and pepper in a medium sauce pan and bring to a simmer over medium heat. In large bowl, toss rhubarb, celery and strawberries. Pour simmering liquid over vegetables and mix well. Let cool to room temperature and then refrigerate, uncovered, overnight to let flavors meld before serving. The rhubarb will keep refrigerated in an airtight container for up to 3 days. Roasting rhubarb preserves its brilliant red color while retaining its shape. It also mellows its tangy bite, which is a good thing for those who might be scared off by the super-tart veggie. “It’s an outstanding alternative to more conventional pears or apples in a crisp salad,” writes Brian Nicholson and Sarah Huck in “Fruitful.” They suggest drizzling any extra syrup over ice cream, Greek yogurt or waffles. Preheat oven to 450 degrees. Line a rimmed baking sheet with aluminum foil. Toss together the rhubarb, syrup and 1 teaspoon of oil. Spread mixture on prepared baking sheet and roast until rhubarb is tender, 7 to 10 minutes. Remove baking sheet from oven and set aside to cool. In a small bowl, whisk together the vinegar, salt, shallot and tarragon. Whisk in remaining 3 tablespoons of oil. In large bowl, combine watercress, walnuts and rhubarb. Gently toss in goat cheese and dressing. Don’t let the greenish tint of this savory chicken dish dissuade you from trying it — it is so, so good. Good enough, in fact, to serve to company. Pat chicken dry and season with 1 tablespoon salt and 1 teaspoon pepper. Place in a bowl with the thyme sprigs and cover with plastic wrap; refrigerate at least 1 hour or overnight. Heat oil in a large skillet over medium-high heat. Remove thyme from bowl with chicken, reserving thyme. Add chicken pieces to skillet and sear, turning occasionally, until golden brown all over, about 10 minutes. Transfer pieces to a platter. Reduce heat to medium. Stir in onion (white and light-green parts) and cook until softened, about 5 minutes. Add garlic and reserved thyme; cook 1 minute more. Stir in wine and bring to a simmer, scraping up any browned bits in the bottom of pan. Add rhubarb, honey, 1/2 teaspoon salt and a few grinds of pepper. Return chicken pieces to pot in a single layer. Cover and reduce heat to medium-low. Simmer until chicken is cooked through, 15 to 20 minutes for breasts and 20 to 25 minutes for legs and thighs, transferring chicken pieces to a platter as they finish cooking. Whisk butter into rhubarb sauce. Taste and adjust seasoning if necessary. Spoon sauce over chicken and garnish with sliced onion greens. Heat a grill to high (450 to 550 degrees). In a medium saucepan over medium heat, cook rhubarb, ginger, garlic, hoisin, sugar, and 1/4 cup water. When rhubarb starts to break apart, about 3 minutes, whisk in soy sauce and transfer half the glaze to a small bowl.